Today ONLY - ciao! baby Portable High Chair $47.99 (Retail $59.99). PORTABLE HIGH CHAIR - Lightweight and flexible design unfolds easily, locks into place, and folds back up in seconds. No assembly required. 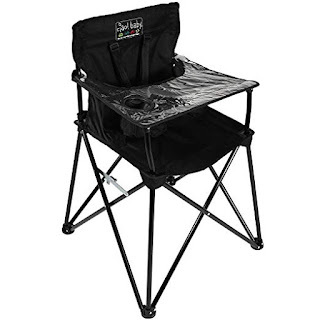 DURABLE MATERIAL - Folding high chair is made of durable nylon and the tray is covered in clear vinyl that easily wipes clean with water. Additionally it features a built in cup holder for all of your baby's needs. EASY TRANSPORT - An innovative, practical solution for families on the go! Portable enough for travel, picnics, camping, vacations, and/or tailgating. Keep one in your car or an extra at grandma's house! FIVE POINT SAFETY HARNESS- Meets US American Society for Testing and Materials (ASTM) and EU European high chair safety standards and all Consumer Product Safety Improvement Act (CPSIA) guidelines including lead, phthalates and flammability. Keep your little ones safe and secure!